One of the most notorious “mirror muscles” that every guy wants. Probably, also one of the biggest reasons that influenced your decision of hanging a “Rambo” poster above your bed…NICE BIG BICEPS. But it’s not just guys. Nicely toned and defined arms are also high on ladies priorities list. Biceps muscles unlike calves where size can be determined by genetics are rarely something that people are just born with. It simply means that you will have to put the time and hard work in. And No, you don’t need a gym, dumbells or an Olympic bar. Luckily for you, there are lots of great bodyweight exercises for your biceps that require very little equipment and can be done nearly anywhere. BEST BODYWEIGHT EXERCISES FOR BICEPS. You look at the picture of these gymnasts and you would really want to know their arms weight routine program. There isn’t any. At least the amount of weight lifting in their program (if any) is not enough to give it a credit for their muscle size. Yes, some gymnasts might supplement their training with iron training, but it has very little to do with the size of their muscles. The size of their biceps is mainly a result of a ton of bent-arm and straight-arm bodyweight exercises like Iron Cross or Maltase, just to name a few. Don’t worry, you don’t have to be on that level in order to work on your guns with your own body weight. Here are 5 best, basic gymnastics bodyweight exercises for biceps. Ring rows is a very basic exercise that is also very important pulling movement in fundamental bent-arm strength progression. It won’t only stress your biceps when done correctly, but it will also build strength and definition in the muscles of your shoulders and back. In the last article, I’ve written about the importance of mastering this exercise before more advanced exercises like chin-ups or pull-ups. If you are a beginner, don’t skip on this one. Tip – To engage your biceps, even more, turn the rings in at the top of the movement, just like in a chin-up position. Get your mettle ready for an intense challenge of grip, biceps, and mental torture 🙂 Whether it’s your next step in bent-arm strength progression or you are already advanced in this exercise, chin-up holds is a great bodyweight exercise to include in your routine to build bigger biceps. 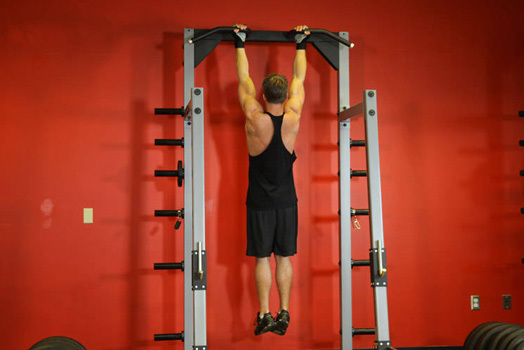 While Ring Rows are a horizontal dynamic exercise, Chin-up Holds will build and strengthen your arms by working your muscles isometrically in the vertical plane. The big benefit of this static hold also comes from activating the Brachialis, the muscle that sits under the biceps. While both muscles ( biceps brachii and brachialis) flex your elbow, brachialis’ mainly slow-twitch fibres are used in stabilisation over longer periods of time. Working brachialis will simply give the appearance of additional size to the biceps. Tip – Focus on keeping your shoulders down and back. Squeeze your elbows back and lift your body as high as you can. While Pull-UP can also greatly engage your brachii, Chin-Up is definitely a superior movement for your guns. Arguably, it could be one of the absolute best exercises for biceps and forearms. Every time your chin clears the bar, you’ve just curled the equivalent of your own body weight. This also shows how much pulling power is reduced when your body has to balance an external weight rather than moving its own weight. Chin-Up will also address your scapula stability, lats, lower traps, and even triceps. Tip- Lower yourself all the way down until your elbows are locked and arms are straight at the bottom. Keep your shoulders back. Don’t roll them forward. Rope climbing was not only common fitness test in high school gym classes all over the world but once it was the gymnastics event in the Olympics. Legless rope climbing can be implemented with different levels of variations and is one of the king body weight exercises not only for your biceps but also for the whole upper body. 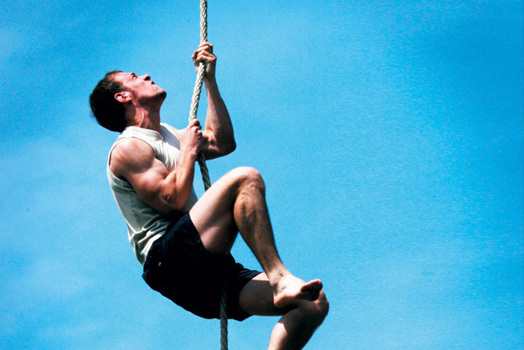 This movement is much more demanding than pull-ups or chin-ups. It will need superior scapula stabilization and will require from you a good amount of time to condition your tendons before you fully engage in it. Tip – Increase distance between hands to add difficulty. Yes, that is right. The support position apart from being the fundamental starting point for the ring training is also one of the best bodyweight exercises for biceps. Like I said before, gymnasts amazing arms development isn’t the result of any kind of dumbbell or bar curling movement. It’s the straight arm training which constitutes a huge part of gymnastics workout. The straight-arm work puts tremendous strain on the biceps resulting in incredible growth. Tremendous strain also means that these kinds of positions and movements will need to be approached in a safe and progressive manner. 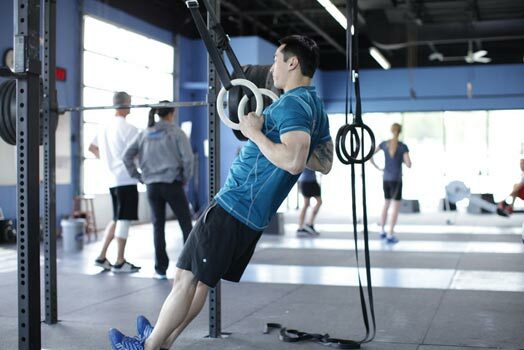 Although Ring Support is one of the very basic ones, most average fitness enthusiasts will need to exercise caution here and they might need a little bit of time preparing for this position. Tip- Focusing on elbows locked and straight, and rings turned past parallel is crucial here.